Ioannina International Airport (Greek: Διεθνής Αερολιμένας Ιωαννίνων) (IATA: IOA, ICAO: LGIO) is an airport located four kilometers from the city center of Ioannina, Greece. Its full name is Ioannina International Airport - King Pyrrhus. 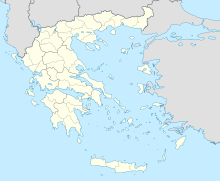 1932 The airport of Ioannina is established. 1953 Construction of the original 450m2 terminal building. 1965 Expansion of the terminal by 450m2. 2007 Airport is named "King Pyrrhus"
2017 Completion of the new control tower and the new taxiway. 2018 Completion of the new departures hall in September. ^ "IOANNINA AIRPORT "KING PYRROS"". ypa.gr. Retrieved 24 Jan 2017. ^ a b "Flight". apollorejser.dk. ^ a b "Flight". apollo.se. Airport information for LGIO at World Aero Data. Data current as of October 2006. This page was last edited on 1 April 2019, at 06:35 (UTC).